Zu Beginn dieses Jahres gab es gleich einen tollen Hackathon, bei dem wir unsere Skills im Bereich App Entwicklung auf die Probe stellen durften. Der Hackathon namens "HackCambridge" wurde von der Universität Cambridge veranstaltet und bat zudem die Möglichkeit auch direkt einen Einblick in's Lebens eines Studenten in Cambridge zu bekommen. We have been to London two weeks ago. It was really impressive but as we were there just for sightseeing we had to head back too Austria (too) soon. During this trip the idea of having a live webcam behind your desktop was born. Your desktop could be something like a magical "window" and help you to feel like actually being there. Especially as devs were spending a lot of time in front of our desktop. We then thought, why shouldn`t we expand the idea to other things like adding a widget for twitter feeds, weather forecasts and so on? 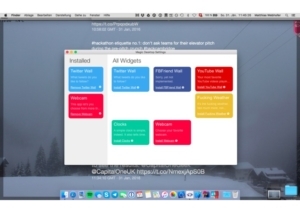 Your desktop could get pretty useful and act like an info-screen. We also thought about interacting with your desktop through gestures. Hier gibt's mehr Informationen zu MagicWindow.